Building a fishing pond is a considerably large undertaking. It involves more than digging a hole, filling it with water and planting some fish. The process involves choosing a suitable location, water source and allowing for manageable, beneficial vegetation. Following is some important information to consider when building a fishing pond that can provide generations of fun and recreation for your family. Choose a location. A good fishing pond does not have to be considerably large. However, it must be big enough to sustain itself in the future and support fish. Map out an area no less than one-half acre. Anything smaller could be difficult to manage in terms of weeds, water quality and ample habitat for fish. Depending on the type of fish you plan to stock, most species need room to roam and find proper places to spawn, feed and seek shelter. Test your soil. Dirt on your land must be fairly compactable. Strong soil will allow water to remain in the pond and not evaporate and seep into the earth too quickly. Test your soil by digging a 3-by-5-foot hole, about 4 feet deep, in the center of your pond grid. Fill it with water. If the soil is suitable, the water should remain in the hole for an hour or longer before seeping into the ground. Dig your hole. Using a backhoe or other digging rig, begin digging your pond. Start in the center, working your way to the shores, creating a slope around the perimeter. A minimum of 15 percent of your pond should be 10 to 15 feet deep, gradually dropping off from shore or underwater ledges. Hire an experienced excavator if you are unskilled in this area. Prepare the pond's bottom. If your pond bottom is not suitably compactable and contains a considerable amount of limestone shale or gravel, you will need to line it with a thin layer of clay or concrete, placed two to three inches under the first layer of soil. This will allow plants to still grow and prevent you from losing water through a porous and unsuitable bottom. Find a water source. Water to fill your pond can be obtained from essentially two sources. If you have viable stream flowing onto your land, dig your hole in the center of the stream and dam one end (see Resources). Before you go that route, contact your state's Environmental Protection Agency or Department of Natural Resources for permission. If you aren't granted permission to alter a natural stream, dig a well and pump water from the ground into your pond. Contact a reputable well-drilling company for help. Prepare your inlet. Place a truckload of rocks at the mouth of your water source. The turbulence caused by this substrate will allow oxygen and gases harmful to fish and vegetation to dissolve before the water enters the pond (aeration). It will also help protect the pond bottom from excessive amounts of water pressure. Fence off the perimeter. Place a 4- to 8-foot snow fence around your pond. This will keep livestock, passers-by and children from accessing it before its filled. Getting too close to the pond before it's filled could damage its banks. Add aquatic plants. Plants help keep water and soil fresh and rich in oxygen. Some plants must be planted in water; some can be planted before you fill your pond. Choose plants that are easily manageable (see Resources). Fill your pond. Allow water to run over the rocky, inlet substrate into pond. Water should enter gradually until the pond it is filled. This may take up to several hours or a few days. Once your pond is full, allow it to sit for a day or two to settle. Monitor water levels closely. Test your water. Depending on which type of fish your plan to stock, they must be able to live in the water. For the first few months, have your water tested regularly. Water rich in acid, non-alkalized substances and heavy metals can be harmful to some species of fish. Contact your Department of Natural Resources for assistance. Installing a bottom-placed aeration system will keep water free from harmful substances and provide a steady flow of oxygen for your fish (see Resources). Let your pond settle. Your pond should not contain fish for at least six months to a year. Use the better part of your first season to allow the pond to settle and aquatic organisms, bugs and vegetation to become established and water to clear before stocking fish. Stock your pond. You must stock your pond with fish purchased from a licensed fish hatchery. Stocking with with fish taken from other lakes, streams or rivers is a crime in most states. Doing so could also add disease to your fish and produce crossbred species harmful to other fish and plants. Your pond should contain more than one species of fish. Some species will help control vegetation and provide food for larger fish. Contact the U.S. Fish and Wildlife Service for a list of hatcheries in your state (see Resources). Add spawning rocks. Along at least one side of your pond, add at least a 10-foot square of pea gravel off shore before filling your pond. This will strengthen your banks and give fish proper places to spawn. It will also provide shelter for crabs, frogs and other animals. 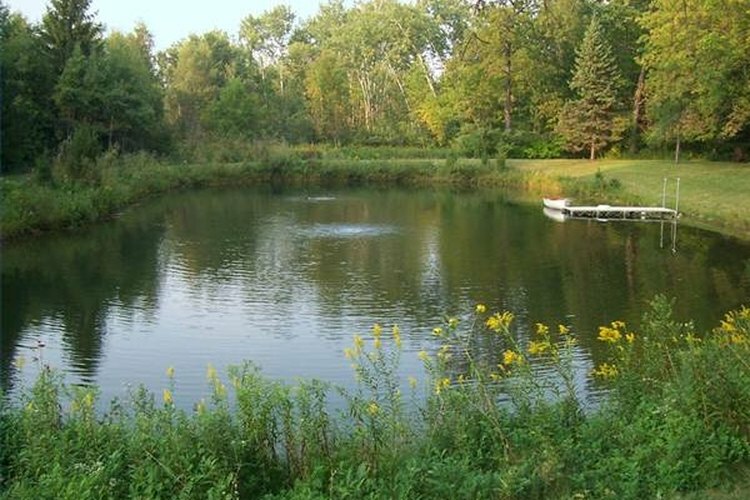 Expect to spend between $5,000 and $20,000 to build and stock your pond. Add crayfish, carp or catfish to help keep your pond clean. Feed smaller fish at least three times a week for the first few seasons. Always add water to your pond when levels become low to prevent robbing fish of oxygen. Dig a drainage ditch if flooding from rain becomes a problem. Always check with your state Department of Natural Resources before you start, even if you are building your pond on your property.